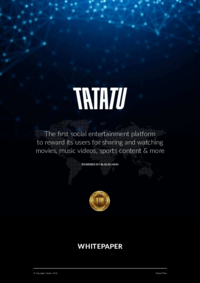 The TaTaTu Platform will be a fair and transparent social media and entertainment blockchain-powered platform. Users will be rewarded for both creating or providing content, and for watching it. All users of the TaTaTu Platform will be able to watch content for free (initially all of it will need to be pre-approved before it goes live). Premium content such as movies, sports footage, and music videos will be provided by entertainment networks. There will also be approved content from celebrities, YouTubers, and other influencers. In time, anyone on the TaTaTu Platform will be able to create their own video content and share it with their friends.